Anyone raising children has probably had at least one experience where meltdown is happening in your home and you are praying that nobody comes to the door because there is no telling what they would think you were doing to your children. While many homes experience this type of event infrequently, there are some homes where this is par for the course and the parents have no idea what to do to stop it. Maybe that is why some creative screenwriters came up with the television show Nanny 911. The show seems to be the buzz around the water cooler as people discuss out of control children who hit, refuse to go to bed when told, slam doors, and basically are running the home while the parents anger and frustration level is increasing by the minute. Enter the Nanny to save the day. Even though most families do not have a Nanny that will come in and reveal the secrets of how to bring order to the home not to worry. George Doub and Flo Creighton, founders of Family Wellness: Survival Skills for Healthy Families have been teaching survival skills to families all over the world for years to assist them in their efforts to be healthy. Every person has two basic needs: the need to express “me,” and the need to connect with “you” (others). In other words, the need to know who I am and the need to know where I belong begins in my family as I am growing up. A family needs to work so that each person can be a separate individual and still have space to belong and fit in with others. The more a family is able to meet both of these goals, the more they will be successful. Family life is a challenge. There are changes we have to make in how we relate to each other as the needs of the individuals change. Each of us has to figure out how to get enough contact to feel secure and enough room to be an individual. According to Mr. Doub, a healthy home is built on a foundation of three skills: to speak, to listen, and to cooperate. Each family member needs to use these skills to find a balance between being their own person and being able to get along with others. The three rooms of the home are the three family patterns that are present in every healthy family: clear leadership with the adults in charge, room for people to be close or sometimes to be alone, and the ability to change as the needs of the individual and family change. What does a healthy family act like? When I was a child, Saturdays around my house were for getting the house picked up for the next week. Only after doing your chores were you allowed to go play with friends or just hang out. I used to think my mother was mean, but the truth is we were all participating in something that contributed to the health of my family. Research shows that in healthy families people are able to take turns at the roles and jobs in the family. Sometimes one person can be a leader and at another time be a follower. Leaders are good at taking care of people and jobs, followers are more in the being cared for position. As individuals and families we need to be flexible enough so that we can change roles and jobs as needed. Expect to change – Healthy families expect that they will go through changes as their needs change. They are flexible. Parents in healthy families accept two roles: to lead and to model. To be successful in life, children need to learn to feel good about themselves and to get along with other people. Many parents believe they grew up with too many rules. In an effort not to repeat the same situation with their own children, they have few rules. Research shows that families with too few rules have children who show little respect for their parents and always get what they want. 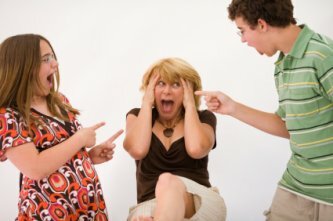 There is very little cooperation among family members and nobody is sure of anything. You never know what will happen next. Family members don’t count on one another. They are expected to know what to do without being told and often feel guilty when they don’t. The family spends very little time together and older children often try to make the rules. Mr. Doub makes these suggestions for making rules in your home. State the rule in a sentence and be specific. Take the trash out by 6:30 every evening. Anticipate areas where children will need a rule and make it. When the guests arrive the television is to be turned off. Get your children’s thoughts on rules that affect them, especially as they get older. Then, you make the final decision. You want to drive the car to a dance and we’re worried about your showing off or getting in an accident. Tell us why you think you are ready for it. Only make rules you are prepared to enforce. Consider your own comfort, as well as your child’s needs in deciding on rules. You would like to stay up until 10 p.m., but your mother and I need some time to ourselves. Bedtime is 9 p.m.
Feel free to change any rule you made which no longer gets the result you want. Now that summer is here, it’s ok to get home by 6 p.m. instead of 4 p.m.
Parents in healthy families stick together A number of years ago, my daughter, Ashley, went through a time where she loved to slam doors. I shared this with a friend of mine who said they had gone through something similar with their daughter. Jay and I decided to handle the situation the same way our friends did. We told Ashley that the next time she slammed her door it was coming off the hinges. A couple of days later, Ashley and I were arguing and she slammed the door in my face. About one minute later, Jay was at her door with screwdriver in hand and took the door off the hinges. Doub believes that one of the keys to families staying healthy is when parents remain in charge. About a month ago, Ashley and I were in the grocery store check out line. I explained to the cashier that the week before I paid for some gum, but never made it home with the gum. She gave me a pack of gum. A couple of days later, I found the pack of gum I thought I had left behind. The following Saturday, when Ashley and I were back in the check out line, I told the cashier what happened and asked her to charge me for the gum. She gave me this look like, “Lady I can’t believe you are telling me this.” I truly believe how Ashley sees me handle little things like that makes as much of an impact as the bigger situations in life. 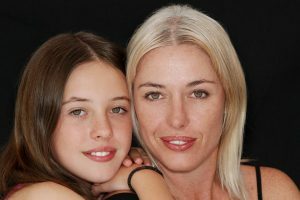 Research has shown that up to age 8, parents have a tremendous amount of influence with their children. After age 8, friends become more influential than parents. By the age of 15 or 16, parents have the least influence and friends have the most influence. Between the ages of 8 and 12, children are developmentally ready to use judgment and learn about values. Families need to get together for fun activities that balance their work of earning a living, going to school and doing household chores. It is important to remember to include children in both work and play. When families work and play well together there are lots of informal opportunities for listening to each other, sharing what is important, feeling connected to each other and modeling appropriate behavior. Sometimes people can get caught up in attempting to build the “perfect” family. Utilizing the survival skills listed above will help you keep perspective. There is no “perfect” family. The best thing we can do is be intentional about striving to become healthy families. This is an awesome article. What a great resource. I’ll be following some of these suggestions – thanks for the tips!